We offer to prospective franchisees the right to operate a franchised business designed to provide exterior cleaning of residential and small commercial dwellings, certain small business facilities and other surfaces, utilizing the Renew Softwash mobile equipment. ReNEW Softwash franchisees must have a strong work ethic. Our system works great as an independent business or as an additional stream of income to a current business. We will train you on use of the products and system and support you as you build your business. The amount of money you make depends on how aggressive you market and operate your business. ReNEW Softwash is a proven process. We are looking for people that want to build a successful business. The total investment necessary to begin operation of a ReNEW franchised business is $43,600 to $67,850. This includes $27,000 that must be paid to the franchisor or its affiliate (s). A unique, safe, and effective low pressure cleaning system designed to effectively clean the exterior of buildings. It is a combination of our environmentally friendly cleaning solutions and low pressure rinse system that makes it stand out from all other cleaning methods. How is this better than pressure washing? 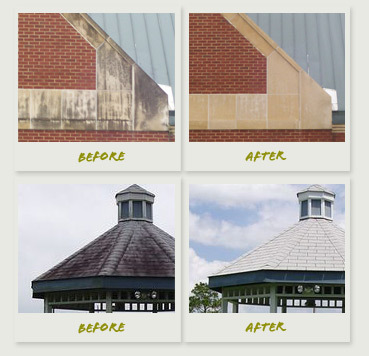 The ReNEW Softwash system uses a proprietary cleaning solution that destroys the root system of fungus, algae, mold, and embedded growth on the exterior surfaces of buildings. Because our cleaning solution destroys the root system it allows fungus, algae, mold, pollen, dirt, and embedded growth to be gently removed from the surface by rinsing with water using very low pressure (300 psi max). Will you train me on the product and how to correctly use it? Yes. There is Initial Franchisee Training and ongoing technical support. Can I operate a ReNEW Softwash franchise and my other business too? Of course, a ReNEW Softwash franchise can be operated as an additional stream of income to a current business. Can I operate a ReNEW Softwash franchise and keep my current job? Yes, a ReNEW Softwash franchise can be operated on a part-time basis. How is your system environmentally friendly? The ReNEW Softwash cleaning solution is biodegradable. If used correctly it is harmless to plants and animals. By environmentally friendly do you mean you are “going green”? Yes, recently our cleaning solution additive has been reformulated using “green components”.